PHILADELPHIA -- The Democratic National Convention is halfway over, and while there was a hefty dose of drama in the first two days, some serious political star power was saved for the final days. The convention heard from two former presidents last night (President Jimmy Carter by video and President Bill Clinton in person) and now tonight, delegates are going to be hearing from current and soon-to-be former President Barack Obama and Vice President Joe Biden. 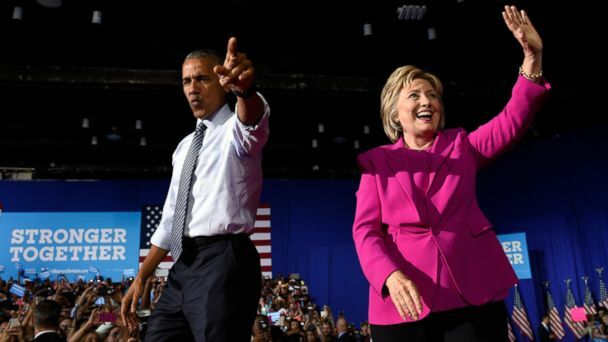 Both men have already publicly spoken about Clinton and supported her campaign, and Obama held a joint campaign appearance with Clinton in North Carolina earlier this month. At that appearance, he said that no one has ever been "more qualified for this office than Hillary Clinton." Meanwhile, Biden went on the offensive against Donald Trump and his running mate Mike Pence during an interview with ABC News on Tuesday at the DNC, saying that "these guys don't know what they're talking about" when it comes to ISIS. Former New York City mayor Michael Bloomberg very publicly considered running as a third party candidate for president but, in March, penned an op-ed calling it "The Risk I Will Not Take." Now, four months later, he is expected to endorse Clinton at the convention tonight. In the op-ed, he didn't mention Clinton once, yet explained that his decision not to run was because "my candidacy could lead to the election of Donald Trump or Senator Ted Cruz. That is not a risk I can take in good conscience," he said of the two Republicans who were in the midst of their party's primary at that time. Bloomberg detailed the issues he took with Trump's campaign in the article, and it seems likely that he will reiterate some of those points later tonight. While tonight may seem like a lineup of familiar political figures, one of the most anticipated speeches comes from Clinton's vice presidential pick, Tim Kaine. Though Kaine has been a Virginia Senator since 2013 and was the chair of the Democratic National Committee for two years, the rest of his political career was largely focused around the state level. Tonight will be an opportunity for him to introduce himself to the nation and help highlight some of the reasons why Clinton went with him. The intersection of race and police has been a hot-button issue in light of the shooting deaths of several African-American men at the hands of police in recent weeks, as well as targeted deadly attacks against police officers. Those events are likely going to be addressed on the convention stage tonight because two of the best-known leaders in their respective communities are slated to speak. Civil rights activist Rev. Jesse Jackson is due to speak at the Wells Fargo Arena as well as former Philadelphia Police Commissioner Charles Ramsey, who was part of President Obama's 21st Century Policing Task Force. Even though Bernie Sanders addressed the convention on the first night, he was still very much on the minds of attendees on Tuesday, when he nixed the roll call vote in an emotional moment. As the week goes on, however, his planned presence is going to be lessened. There is no planned action on the floor, and he isn't slated to make another address to the convention. His supporters are still out in force, both inside and outside the arena, but the leader of that movement isn't scheduled to still be a regular figure in the party's convention.